To find out what this service provides you can check out our complete list of PerfectMatch.com features. 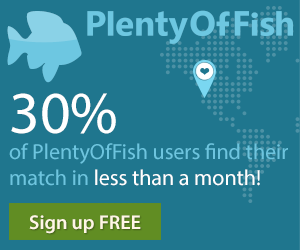 The once popular dating site PerfectMatch.com has closed down. When you visit the service you are shown a goodbye message. The message states that the dating site has closed down and any remaining time on your subscription that is left will be refunded in full on to your original form of payment. From around 2005 to 2010 Perfect Match was a popular choice for singles interested in online dating. The site was featured in a number of popular movies like Must Love Dogs and appear on talk TV shows like Dr. Phil and Live with Regis and Kelly. PerfectMatch used the Duet Total Compatibility System which was created in part by the relationship expert Dr. Schwartz. This dating service emphasized long-term relationships and had a detailed profile and complex matching algorithm. Unfortunately Perfect Match didn't stay current with technology and let their product go stale. As far as I know there never was a mobile app released ever on the iPhone or Android phones. 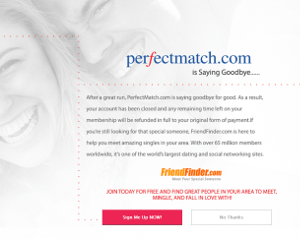 In 2011 PerfectMatch was acquired by FriendFinder which didn't help the dating service at all and it continued to slowly slide into obscurity. The Editor's Top Pick - Innovative Award recipient for 2010 is PerfectMatch.com. We found that they were the dating site which had risen above others by offering more new and updated features for their service which make it even easier for PerfectMatch.com members to meet and communicate with each other. Some of the new features were as simple as allowing members to express if they liked a certain part of a members profile and/or photos. They could also explain why they liked it by choosing from a list of predefined statements. This feature gives members a good way to break the ice since a message is sent to the other member, telling them of the connection. The initial communication with someone can be one of the toughest things to do on a dating site. Having a feature like this shows that PerfectMatch.com understands what members may need to help start jump start communication. Other new tools in 2010 include "Compare Us" and a News Activity feed. 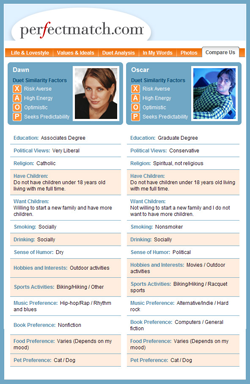 "Compare Us" offers a side by side comparison of your profile and your potential matches making it easy to see what works and if any deal breakers exist. The News feed updates members on their homepage with all of the latest actions of their matches. This includes things like any communication you have received, to your profile getting bookmarked. Another unique dating tool PerfectMatch started offering was video profiles through Dating on Demand. This allowed members to be featured on TV across the United States through Cox and Comcast Digital cable. For members to participate all they needed to do was attend a free Perfectmatch / Dating On Demand video event (held in major cities). A professional crew at these events will tape your 2 to 5 minute interview of you answering questions about who you are and the type of person you are looking for. If you are unable to attend the event PerfectMatch.com members also have the option to send in their own videos. PerfectMatch.com is a full featured dating service. In 2010 they continued to innovate and improve their dating site making it the winner of this year's award and a dating site worth checking out. Read our review of PerfectMatch.com for more information about this online dating service. The Game Show Network has a new dating TV show called Baggage and it is hosted by none other than Jerry Springer. The show first aired on April 19 and runs weeknights at 6:30pm / 5:30pm central time. Perfectmatch.com is a featured partner of the GSN and will be featured on the show as well. So what is the half hour show Baggage about? It involves 3 contestants and one dater. Jerry Springer coaxes the dater to choose among the others who should reveal their hidden flaws, what people would consider relationship baggage and what most would keep hidden well into a relationship. Note: Unfortunately the source to the video and/or image which once was displayed here has since been removed by the authors for an unknown reason. If you are a fan of the Jerry Springer show (which is in its 19th year by the way and one of the longest running TV shows) you should enjoy Jerry's new show Baggage. For more on this new dating show you can check out the Baggage website on the Game Show Network. For further details about the dating site featured on Baggage you can read our Perfectmatch.com review.